When Daisy Garnett and her husband moved into their London townhouse 10 years ago, the garden was overgrown with ivy and other entrenched species. It was evident to Daisy that the previous owner, who had lived there since the 1940’s, had been a good gardener when she was younger. 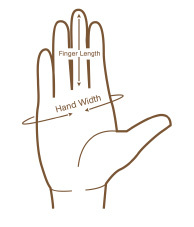 There was a well situated apple tree, a mulberry, a lilac and a bay tree, all of which still stand. There was also a greenhouse that was falling down. After clearing the property she was left with a big brown patch, Daisy recalls. 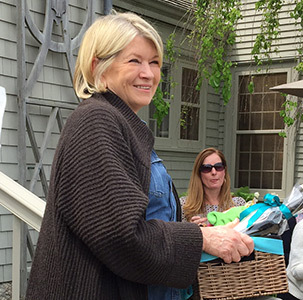 Although she wasn’t a gardener yet, she declared “I’m going to make this my own.” And she did. 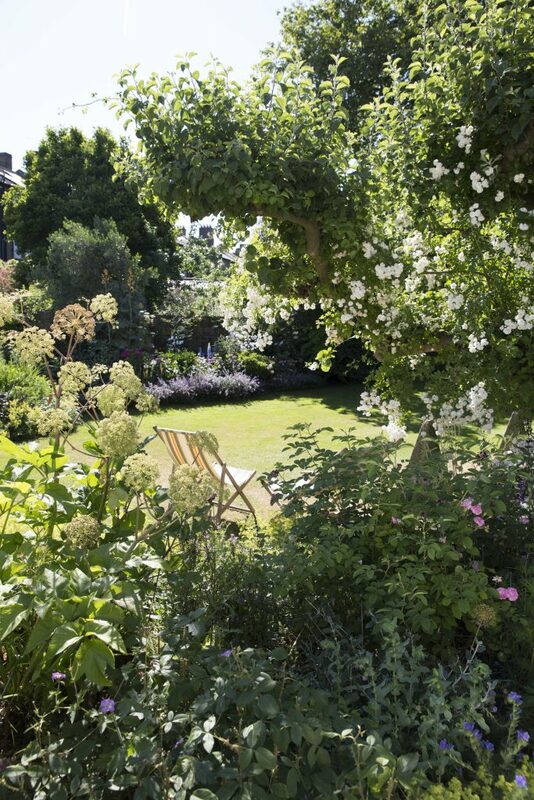 Daisy’s June garden in London is an oasis filled with abundant blossoms. Angelica (left foreground) lends structure. 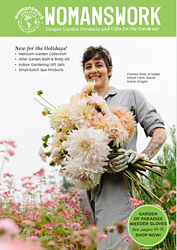 As Daisy started to plan her garden she realized that she had a level of self confidence about her plant choices that many new gardeners don’t have. “From my father, I developed a firm idea of what I liked,” she says. Her father was the passionate gardener in the family when she was growing up in the West Country of England, and as a child she helped him with small tasks, as children do. 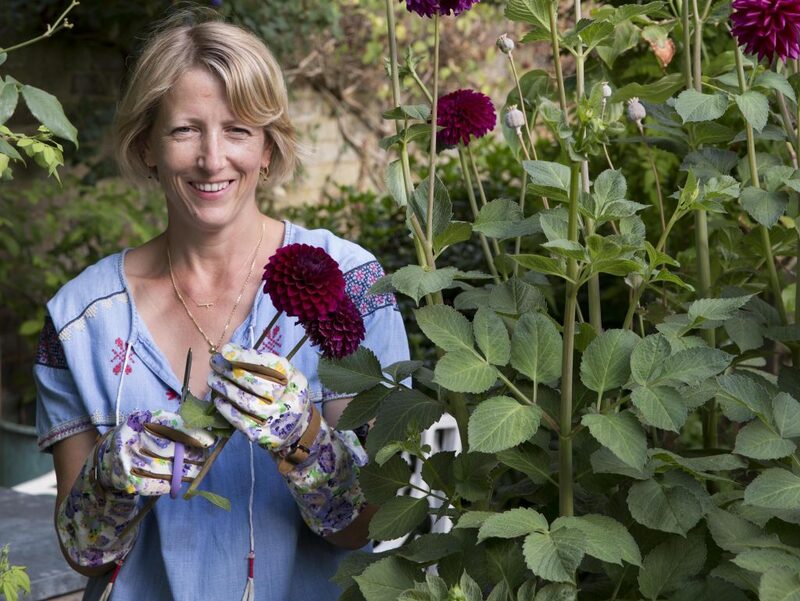 But she wasn’t really interested in gardening until she had a garden of her own– in London. Her father’s garden was full of roses and an abundance of ‘frothy’ flowers, as she calls them, and so is Daisy’s. She considers her garden to be informal and mostly unstructured, but well placed architectural plants such as thalictrum, and accents of color such as the acid green of Alchemilla mollis, one of her favorite plants, lend structure. See Daisy’s list of favorite plants below. 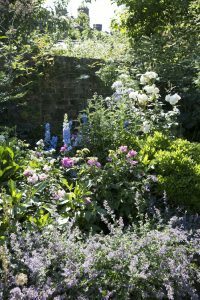 An 8 foot wall bordering Daisy’s garden is a backdrop for roses and delphinium, with nepeta in the foreground. 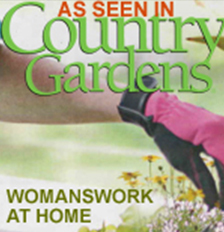 In the early years of creating her garden Daisy and her husband took on ambitious hardscaping projects such as adding a terrace off the kitchen that is level with the garden beyond; building a pergola for dining; rebuilding the 90’ long brick wall along one border of the garden; and renovating the old greenhouse on the property. Now her priorities have shifted a little. She spends time, when she can, volunteering at the gardens at her children’s school and helping with The National Garden Scheme. Daisy is also a professional writer and journalist. 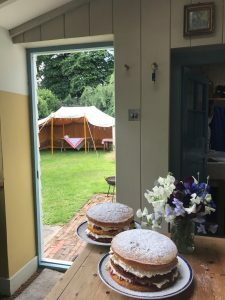 A tea tent with home baked cakes for sale in neighbor Caddy Wilmot-Sitwell’s backyard. 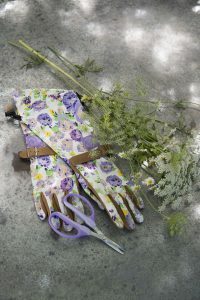 Womanswork Purple Floral Arm Saver Gloves with Purple Scissors. Amni majus and chamomile from Daisy’s garden. 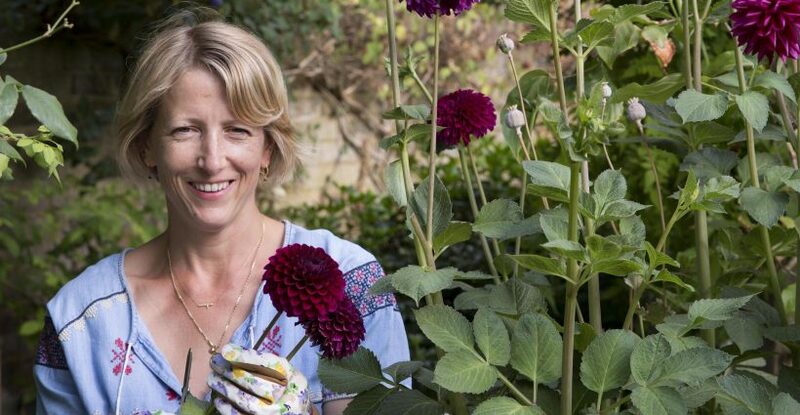 In June Daisy opened her garden to raise money for British charities through The National Garden Scheme. She teamed up with her next door neighbor Caddy Wilmot-Sitwell to offer ‘two gardens for the price of one admission ticket’ to visitors who numbered around 300 over the 3 hours they were open. In her yard she held a plant sale with annuals she started from seed in her greenhouse, and divisions of more unusual perennials. Her neighbor Caddy set up a tea tent and sold home baked cakes. All proceeds from the tea tent and plant stall were donated to The National Garden Scheme charities. Photos for this story were taken by Sarah Cuttle in the UK.